Junior Open House | Saturday, April 27: The Junior Open House is an excellent way to get a preview of your life as a Future Husky! Your day will include an admissions presentation, a campus tour, academic sessions, and a resource fair. Summer Visits: Our summer visit dates will be available in early May and visits will begin in late May. We look forward to seeing you on campus this summer! Group Information Sessions and Tours: You'll hear an admissions presentation and will tour campus with one of our BU Student Tour Guides! Visits are offered Monday-Friday during the semester (excluding holidays). Our spring semester visits end on Friday, May 3. Transfer Visit Days and Evenings: Interested in transferring to BU? Please join us for a Transfer Visit! 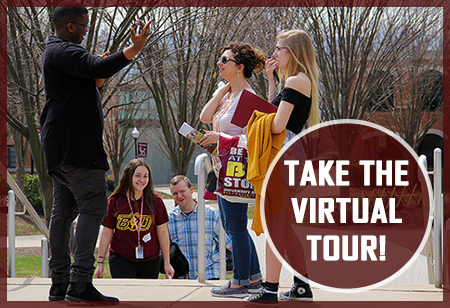 Transfer Visits are great opportunities to learn more about the transfer process, see the campus on tour, and meet current and future transfer students. Transfer Visits are offered throughout each semester. » Parking: We will send you directions and a one-day parking permit by regular mail. If you do not receive this information prior to your visit, please contact buadmiss@bloomu.edu, and we will assist you. » Directions to Campus: Located in Northeast Pennsylvania, BU is within two to three hours of many metropolitan areas. » Special Requests: If you have special interest in a service or program of the university or facilities not on the tour that you'd especially like to see, mention it to the admissions receptionist upon your arrival. We will try to assist with a connection. » Visiting My Major: If you are interested in speaking with another department during your visit, such as an academic department, please contact them directly. » Wear Comfortable Shoes: Part of the campus tour is a walking tour which is approximately one to 1 1/2 hours. This loops around most of lower campus. The campus is handicapped accessible. » Weather Report: Please be sure to review the weather report for the day of your visit. » Where to Eat? In addition to the usual campus fare at several venues, there are many independent and chain restaurants in downtown Bloomsburg and along Route 11, just south of campus. » Explore the surrounding area! Columbia and Montour counties offer breathtaking scenery and year-round outdoor recreation. Visit nature preserves, wetlands, state parks and rails-to-trails. See Bald Eagles, waterfalls and corn mazes. Looking for a slower pace? Explore the area's 25 covered bridges or take a self-guided walking tour in the historic downtowns of Berwick, Bloomsburg and Danville with their beautifully preserved Victorian treasures.